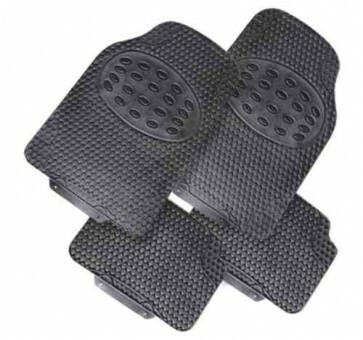 SUPERB SET OF CAR MATS BRAND NEW VERY HIGH QUALITY THICK HARD WEARING AND LUXURY STYLE UNIVERSAL FIT - FITS ALL VEHICLES Pack of 4 Fronts 64,5 cm x 45.5 cm Rears 31.5cm x 44.5 cm Universal Fit all cars and 4x4s Easy fits in seconds! Hygienic & Easy Clean Supplied in a retail hook pack SENT BY COURIER NEXT DAY! PLEASE NOTE THESE ARE NOT THE CHEAP THIN FLIMSY CARPET MATS - THESE ARE THE THICKER BIGGER HEAVIER AND STRONGER TYPES!! FRONTS ARE OVER 2 FT X 1.5 FT (26 INCHES X 17 INCHES) REARS ARE 1,5 FT X 1 FT (17 X 12 INCHES) AN ABSOLUTE BARGAIN AT THIS PRICE AND WE WILL SEND THEM BY COURIER IMMEDIATELY! !